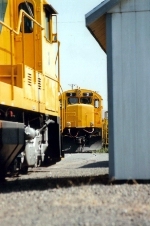 Description: Camas Prarie Railnet B23-7 2 trails the light power move through Ottawa. 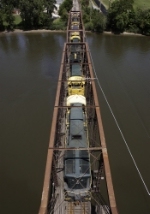 Description: Railnet train heads over an ex-BNSF bridge in Montgomery with the Ottawa Job. Description: 4 engines head light, back to Ottawa for the night. Description: I thank luck for this shot. We just got back from Subway abd were heading in this direction, but then heard a small blip on the scanner. We rush to the crossing only to find the crew inside the engine and ready to take off. Description: 1, 2, 3, 4, tell me that you love me more. ~Fiest; 1, 2, 3, 4.